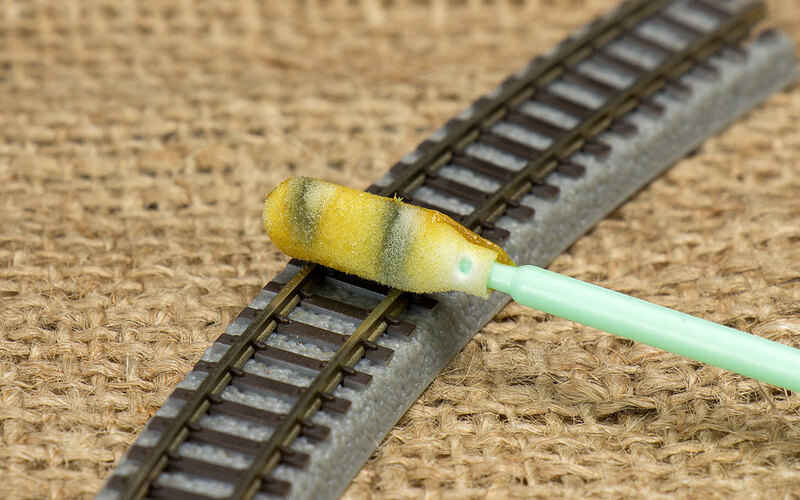 There was a recent post on a forum talking about revitalizing some old, corroded track and the product NO-OX-ID A-SPECIAL electrical grease was brought up in the conversation. This is one of those products you hear about from time to time, make a mental note to buy but never actually get around to buying it; I’ve got a list of these. 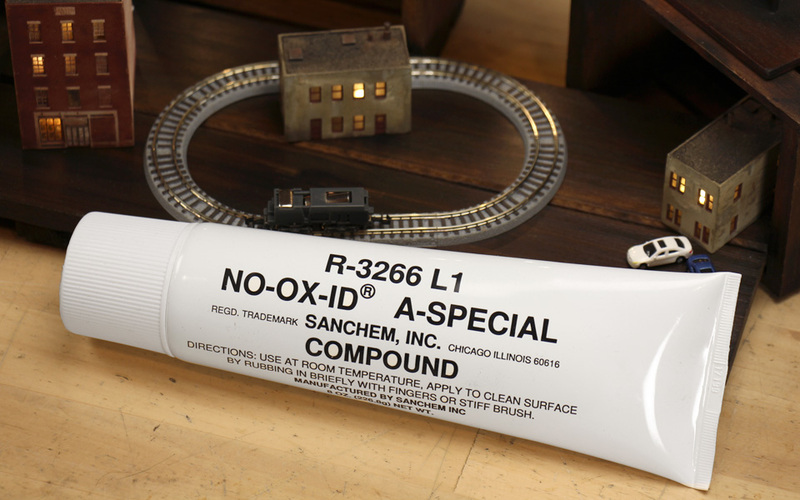 For those who aren’t familiar with NO-OX-ID A-SPECIAL, here’s a description from their website, “NO-OX-ID A-SPECIAL is the conductive grease compound and rust preventive that prevents corrosion and lubricates electrical connections”. This time I did take the plunge and purchased a tube. 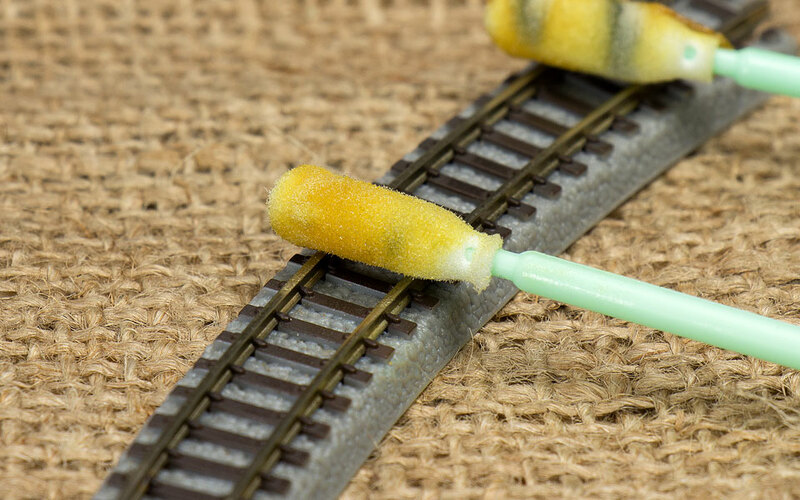 When the NO-OX-ID A-SPECIAL arrived I was surprised at just how much you get, I can see why model railroaders say they’ve had the same tube for years, decades even. 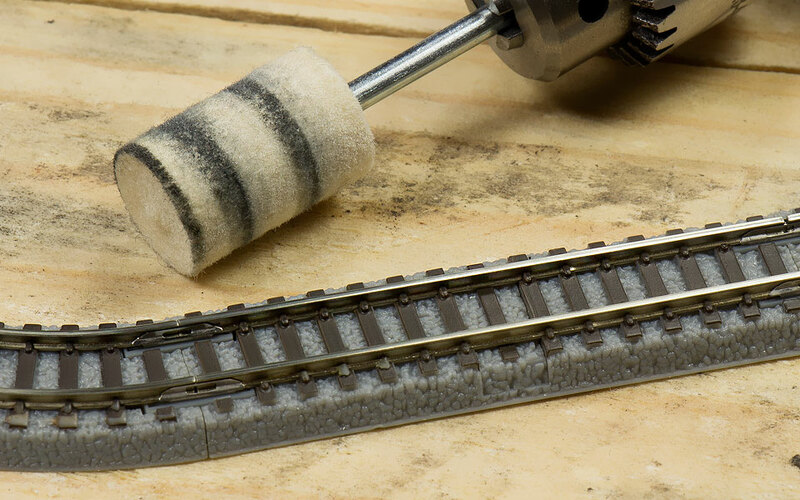 There are some truly amazing stories online from model railroaders who say they’ve applied NO-OX-ID A-SPECIAL to their rails and literally not had the need to clean their tracks for years afterwards. Sounds too good to be true, doesn’t it? I wanted to apply the NO-OX-ID A-SPECIAL and run some tests right away, and for this I’ve chosen the Rokuhan Z scale Shorty, powered chassis and matching Shorty loop of track. 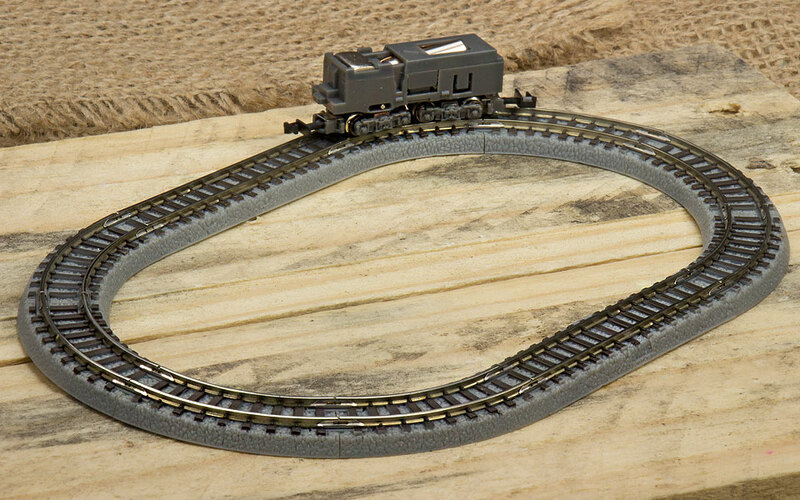 This loop of track is about 12” in total length and the chassis weighs in at 8.5 grams, or the combined weight of a US quarter and dime. I’ve had this little chassis and track for about a month now, running it every day, and I estimate I’ve put a bit over 200 hours of run time on it. Initially I cleaned the wheels and the track every couple of days, now I find myself cleaning it after 8 or 10 hours of continuous running. 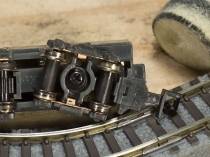 It has a pair of traction tires and I think I’m beginning to wear them out just a bit and some of the gunk I’ll see on my rails may be a result of this. Just for the heck of it, over the last few days and prior to receiving the NO-OX-ID A-SPECIAL, I’d put a single drop of Atlas Conducta Lube on each rail. After a couple of loops around the track to spread the Conducta Lube, the little chassis would run much better at slow speeds. It seemed to me however that this single drop application would only last for a few hours of continuous running. Still very good, but I’d then either need to apply more, or clean the tracks and chassis wheels. 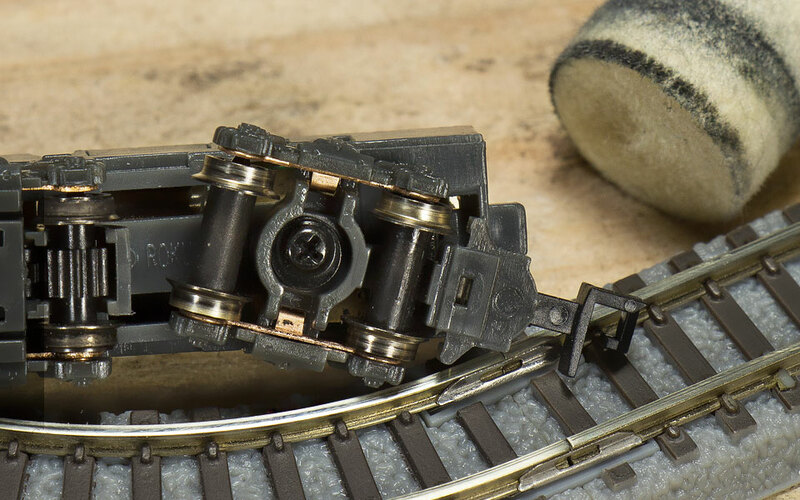 For this test, I had applied several single-drop applications of the Conducta Lube over roughly 30 hours, with no track or wheel cleaning during this time, wanting to start this test with relatively dirty wheels and track. At this point the track wasn’t terrible, but given the light weight of the chassis and tight curves of this track loop, its slow speed running was a little choppy. TRACK CLEANINGFirst thing to do was to get the track and wheels very clean. I was going through my toolbox and came across an unused Dremel polishing wheel and thought, let’s give this a try! 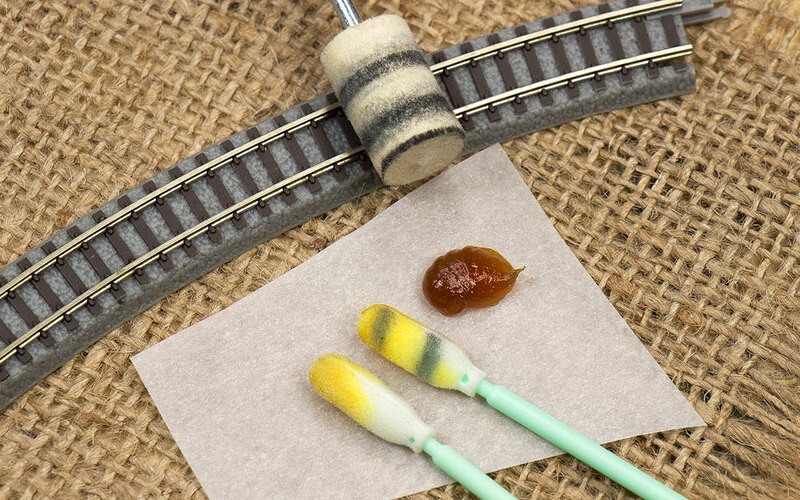 Unfortunately it produced way too many loose fibers (it was an old wheel), so I ordered up some new felt wool polishing bits which were much tighter, more compressed. As long as I was buying things, I also picked up a little 12vdc motor with a drill chuck. I could have used my Dremel, but I wanted a powered unit that would be more precise to handle in tight spaces. Plus of course, for $10 it looked like fun! 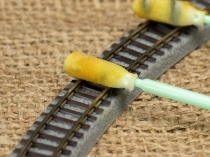 I have to say I was surprised at just how much gunk came off the rails of this little loop, shocked really. 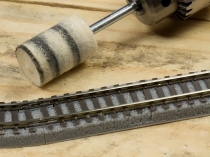 A few passes with this felt bit and the rails looked very clean. As long as I was at it, I also gently touched the end of the felt bit to the wheels on the unpowered chassis truck. Previously I’d always just cleaned my metal wheels with a few swipes of an alcohol-soaked foam-tipped applicator. That works well, but this powered method really surprised me, again, with the amount of gunk it removed from my wheels. Remember these wheels have 200+ running hours on them. 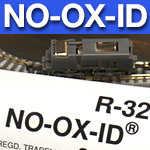 NO-OX-ID A-SPECIAL APPLICATIONI’ve read about two main ways to apply NO-OX-ID A-SPECIAL to the rails. 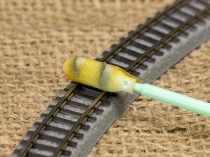 The first way is to apply a thin coat to your track, let it sit for several hours and wipe it off. The second way is virtually the same except you run your trains without letting the NO-OX-ID A-SPECIAL sit for several hours. This way you’ll also get, so I’ve read, a nice thin coating on your wheels. Being kind of impatient, I chose the latter. For the actual NO-OX-ID A-SPECIAL application I used the printer-cleaning foam swabs I wrote about in a previous article. Lots of people use a paper towel, cotton cloth or just use their finger to apply the NO-OX-ID A-SPECIAL. I used a pair of foam swabs for a more precise coating. I applied a heavier coat of NO-OX-ID A-SPECIAL to the first swab to make sure I didn’t miss any rail surface. Also, this first swab cleaned away and remaining residue from the felt polishing wheel. The second swab had much less NO-OX-ID A-SPECIAL on it, and you can see that by the time I ran this second swab around the loop, virtually all the gunk was gone, leaving nothing between the rail tops and the thin coating of NO-OX-ID A-SPECIAL. This should be an excellent application. INITIAL RESULTSI immediately began to run the cleaned Shorty chassis around the track, and it did run beautifully at very slow speeds. 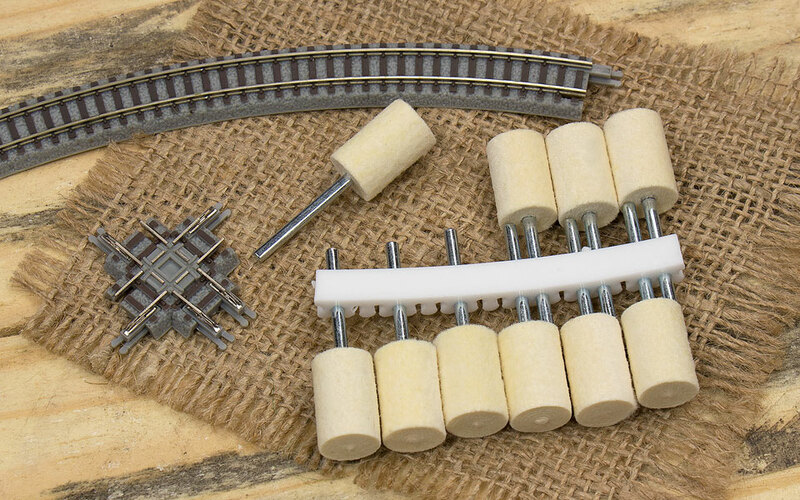 Of course, immediately after cleaning almost all locos run well even without any track additives. As I write this, this chassis has been running for a little over 10 hours continuously the next day, and its speed is still very slow without a single hiccup that I’ve seen. I’ll write a short follow up in a week or two, but so far, I think I may have become a NO-OX-ID A-SPECIAL believer. There are a lot of forum posts and articles out there regarding NO-OX-ID A-SPECIAL, and users’ experiences with it. I’d strongly recommend reading through some of these to see if this may be something you’d want to use on your own layout. 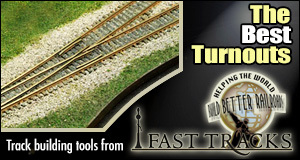 You could always set up a small test loop yourself and see how it goes prior to applying it to your layout. My biggest concern is the NO-OX-ID A-SPECIAL will attract, or at least collect, dust and whatever other particles are in the air and cause my nice thin NO-OX-ID A-SPECIAL coating to become gunky. 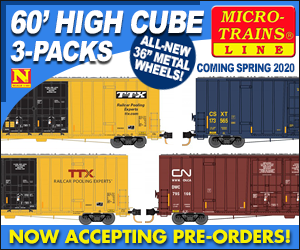 This is actually another reason why I’ve done this test in Z scale. 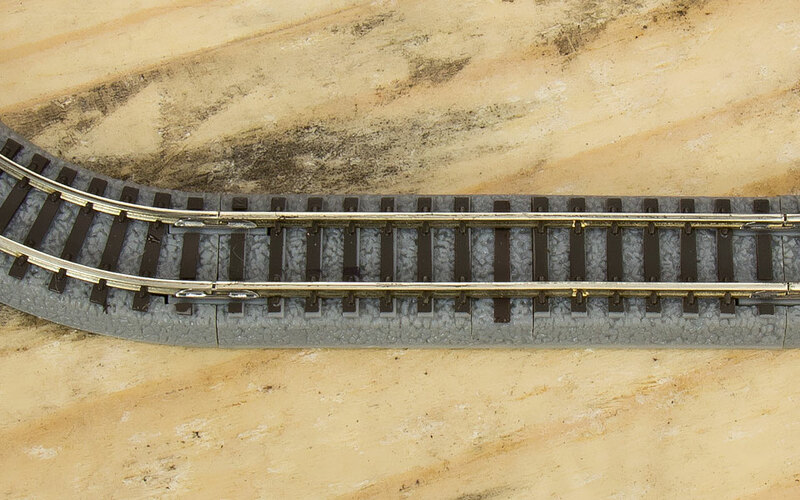 Z is far less forgiving due to its size than other scales, so if holds up in another week or two with no additional track cleaning, I will be an official NO-OX-ID A-SPECIAL believer. 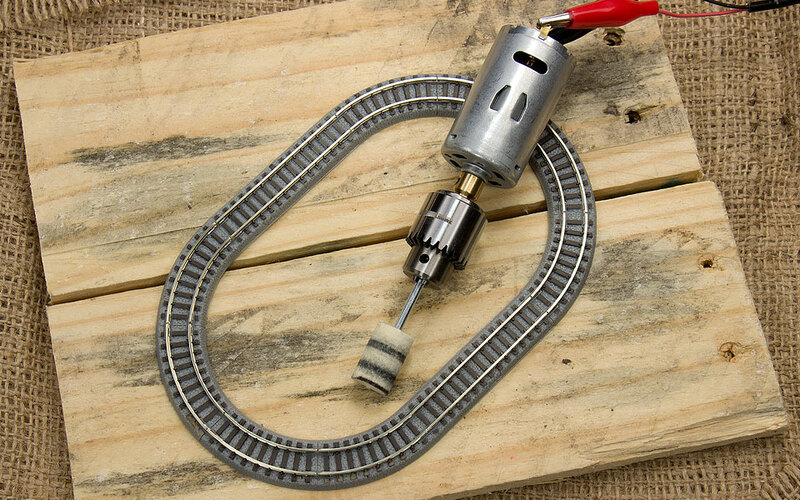 Also worth mentioning, we are using our own Ztrains Slow Speed Control Wire with the Rokuhan Shorty. This little extension plug allows for finer control of slow speeds when using the Rokuhan controllers.